From $179. Prices likely to spike higher in the autumn and spring. Fall in the Adirondack Mountains is a time of generalized confliction. Coming in search of outdoor tranquillity, you might find yourself vying for a piece of the six million-acre park that more than 10 million visitors have come to enjoy (roughly 137,000 people live here year-round). Here, cabins, lakeside villas and cottages are the accommodation staples. But what about a modern indulgence? The storied Hotel Saranac in Saranac Lake, with its glowing white neon rooftop marquee and palazzo-inspired architecture, reopened in January after a $35 million, four-year restoration. The last of the 13 properties that ringed the lake through the 1920s, the Hotel Saranac has been rebranded as part of the Curio Collection by Hilton. It features terraced public spaces overlooking the village, a spa, a restaurant and a bar with an adjacent ballroom — 2,362 square feet of original herringbone wood flooring and wood paneling — befitting its Jazz Age beginnings. With its location on Main Street, Hotel Saranac sits at the near-geographic center of the village. The hotel is a 15- minute drive from both the Adirondack Regional Airport and the town of Lake Placid. From the hotel’s many outdoor seating areas, it would be easy to watch in peace as the fog tumbles down the MacKenzie Range mountains of the Adirondack Park. Attention was given toward making the windowless bathroom feel like a modern, urban wellspring of personal care: A rainfall showerhead in the stall was surrounded by glass and white honeycomb tiles, and spa products (from Red Flower) featured the fragrances of leaf extracts, chamomile and cucumber. 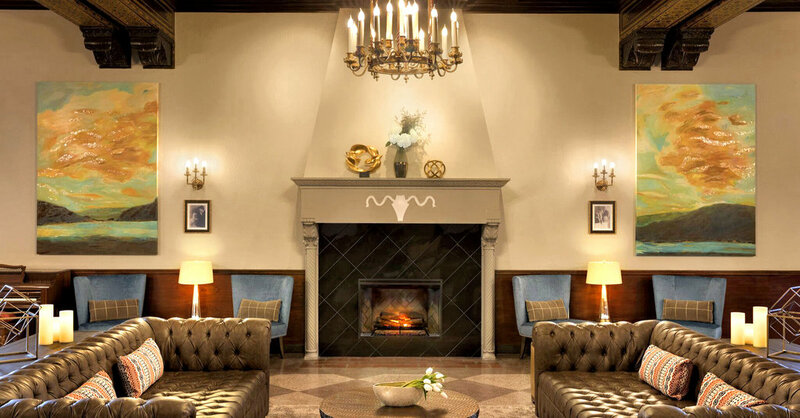 The hotel’s Great Hall commands the second floor and was influenced by the 14th century Palazzo Davanzati in Florence, Italy, with ornately painted grand beams that depict geese, hare and fish, tennis rackets and golf clubs. You can linger by the fireplace near the bar, or step out onto the adjacent terrace that offers a veranda — complete with fire pits and umbrellas to combat the overnight mist — overlooking Main Street. Because of the hotel’s historic designation, coffee and tea are not provided for each room, though they are available in the Great Hall beginning at 7 a.m. A 24-hour gym in the hotel’s basement has all anyone would need were the rain and muck to discourage a hike or nature walk. Tuck into a window seat at the Campfire Adirondack Grill + Bar where David Pittman, the head chef, serves an array of hearty seasonal plates like venison chili with tomato ragout and cornbread ($9). The campfire dinners ($19 to $32), including roasted chicken and a grilled New York strip steak, are complimented by a colorful array of “kindling:” grilled corn with Dutch knuckle cheese ($5), pan-seared ratatouille ($6) or roasted cauliflower in brown butter ($7). Hotel Saranac harks back to a bygone era, simultaneously fulfilling its promise to embrace a rough-hewed legacy in the Tri-Lakes region while maintaining the visage of a distinctly contemporary mountain hideaway.